An amazing feat of software engineering, Unveil certainly delivers on its promise. It really does remove reverb from anything; straightforward and easy to use; gives interesting results when pushed to extremes. It may not be the holy grail of extracting single parts from multi-track mixes, but UNVEIL's boast of being able to remove reverb from single and multichannel sources should be enough to get any serious engineer seriously interested. Zynaptiq points out that Unveil doesn't use envelope shaping, expansion or phase cancellation. Its proprietary MAP (Mixed-signal Audio Processing) models the human auditory system all the way to the brain, analysing the input signal to determine which parts are 'significant' and which less so. "Zynaptiq cites a range of potential uses for UNVEIL, from music production to dialogue mixing and even mastering and, if that's what you do, Unveil is indeed a gift from the gods." For a plug-in that clearly implements some very heavy algorithms (with a similarly heavy CPU overhead), UNVEIL has an admirably straightforward interface. There are five main controls: Focus, Localize, Refract, Adaptation and Presence. Focus decreases reverb and mud in the top half of its travel and attenuates the dry signal in the bottom half. The other four are used to tailor the algorithm in terms of frequency response, processing envelope and more. For full mixes, we tested UNVEIL on a range of reverb-heavy material, from old soul, reggae and rock tracks, through some big orchestral numbers, to the deepest house and dubstep. The results were hugely impressive. Most of the time, it really is as if the ambience on each individual instrument in the mix is dialled back on its own channel, with only the most spatially complex mixes causing any sort of issues. Similarly, individual channels can be dried out as if the reverb was never there in the first place. Introducing reverb and mud/grit/filler back into dry signals is done by lowering the Focus, thus fading out the dry signal. This also works well (even on full mixes). 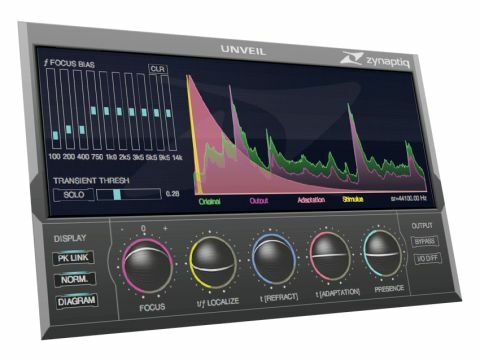 Zynaptiq cites a range of potential uses for UNVEIL, from music production to dialogue mixing and even mastering and, if that's what you do, Unveil is indeed a gift from the gods. It doesn't just get rid of reverb, it backs off everything else that the human ear pays little conscious attention to - low-mid mud and grit, essentially - making it equally effective as a clean-up and focusing tool. It even works on mono files, another sizeable plus. For mastering, though, you'd have to be very confident in your ears and the transparency of the plug-in to use it in earnest, but hey, that's what the demo's for. Give it a try. Being such a specialist plug-in, UNVEIL isn't cheap, and it definitely needs a full manual. Some control over the I/O Diff volume compensation would be good, too. It also, understandably, struggles to totally defeat really, really long reverbs. Beyond that, though, UNVEIL is stunning - revolutionary, even. It's one of those plug-ins you want to push all your sounds through just to see what happens - and the reverb reduction feels genuinely miraculous.